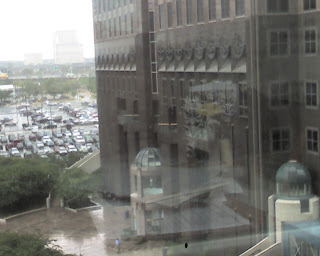 Here is the view of Downtown Dallas from my cube on the 5th floor of 2100 Ross Ave a.k.a 2121 San Jacinto and may soon be 2100 Cesar Chavez. Picture one is the Cathedral Quadalupe. I walk by it twice a day, and sadly enough, I do not know the name of it until today. 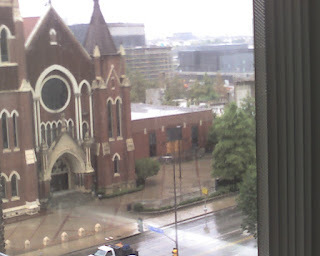 Picture two is Chase Tower. My friend, Wendy works there. 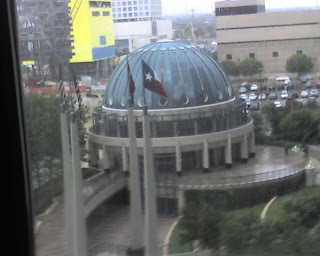 Picture three is a planetarium. Not really. I don't know what it is. It's on same side as the Chase Tower. Maybe Wendy knows. Remember the Alfred Hitchcock film? It always freaks me out when I see flocks and flocks of birds congregating in one area. 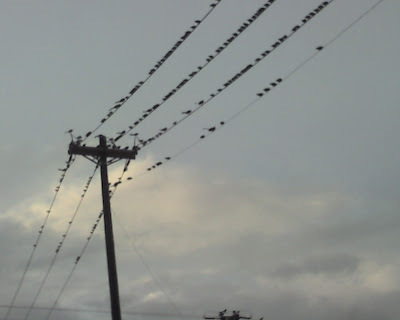 These punk birds were swarming on the corner of Hwy 80 and FM 460 (the exit to my community). This picture doesn't really depict all the birds that were there. This was the best picture I could get from my cellphone in my car. It was really creepy. I had my windows open, and they did their swoop right over my car. Thank goodness they didn't leave any "droppings". Have you seen the new Dell commercials? They have laptops in a variety of pretty colors. There is a pink one, to match the girl with the cute pink scooter. Guess what??? That could be my mystery pink power ranger aka scooter girl - if her hair was only longer. My point - if you have invisioned that much pink from my previous blog - you were right to do so. Sadly, no more sightings of my favorite pink power ranger. I am sure she is alot safer now that she appears to be staying off HWY 80.